This recipe is from Melissa Clark’s cookbook Dinner: Changing the Game – my copy has a bunch of post-it tabs sticking out of it already! I really liked the roasted vegetables with herbed buttermilk dressing, for example. (And while I’m at it, here’s an interview with Melissa Clark in The Cut which I enjoyed.) 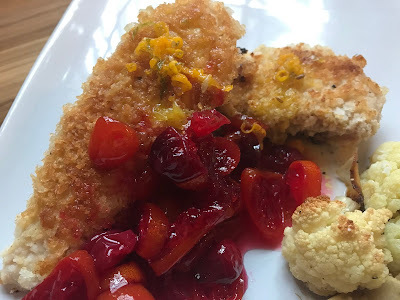 This recipe, crispy chicken cutlets with kumquats and cranberries, seemed perfect in late winter, before the kumquats were gone. I omitted the jalapeño from the chutney (which isn’t actually chutney, as there’s no vinegar! ), and in hindsight, I think that the dressing is optional and I wouldn’t bother with it next time (though I used it on a salad later in the week and enjoyed it). This was really good, because what’s not to love about fried chicken? Not to mention the delicious sweet-tart flavors of the kumquat-cranberry sauce, which were great! I served it with parmesan-roasted cauliflower, but I’m now thinking rice would have been better, especially drizzled with the citrus dressing. 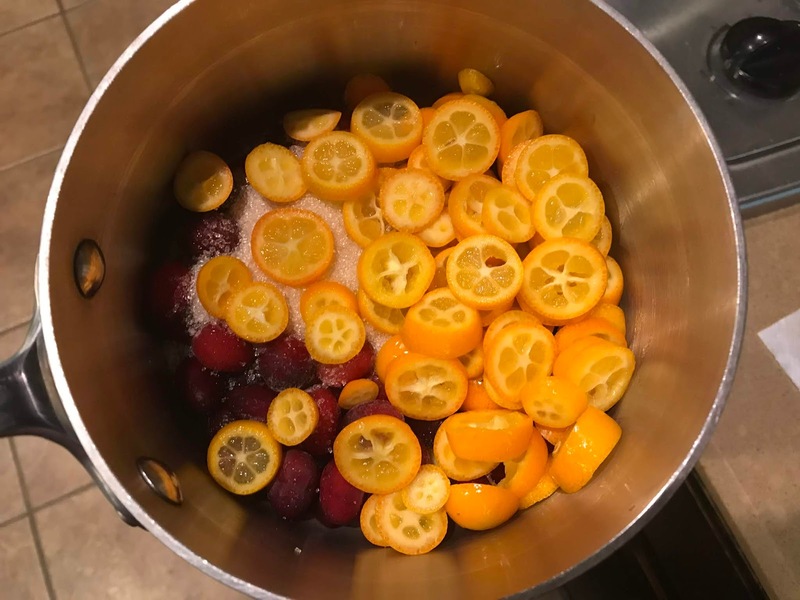 In a medium pot, combine the cranberries, kumquats, and sugar. Cook over medium heat, stirring frequently, until the sugar has dissolved and the cranberries have begun to pop, 7 to 10 minutes. Remove from heat. Heat a small skillet over medium heat and toast the cumin seeds in it until fragrant, about 1 minute. Transfer them to a medium bowl. Holding a microplane over the bowl, grate the zest of half the orange into the bowl. (My microplane is the type best suited for garlic, ginger and parmesan, not citrus zest, so I did this with my zester. And I prefer a clean jam jar to a bowl.) Then juice the orange and add the juice as well. Grate in the line zest and squeeze in the juice. Add the ground cumin, salt, and a few grinds of black pepper. Whisk in the olive oil. Set aside. Pat the chicken cutlets dry. Place the flour in a wide shallow bowl and season it with ¼ tsp. each of the salt and pepper. Place the eggs in another wide shallow bowl and season them with ¼ tsp. each of the salt and pepper. Place the panko in a third wide shallow bowl and season it with the ground cumin, remaining ½ tsp. salt and remaining ¼ tsp. pepper. Season the chicken cutlets lightly with salt and pepper. Dip each cutlet first in the flour, then in the eggs, and then in the panko, turning them in each mixture to make sure they are well coated. Heat about ¼” oil in your largest skillet over medium-high heat. Add chicken cutlets (in batches, if necessary) and fry until they are deep golden brown and cooked through, 3 to 5 minutes, turning once. Transfer the cutlets to paper-towel-lined plates to drain; season them lightly with salt while they are still hot. Serve the cutlets topped with the chutney and drizzled with the citrus dressing.